Need an easy dinner that your kids will love? 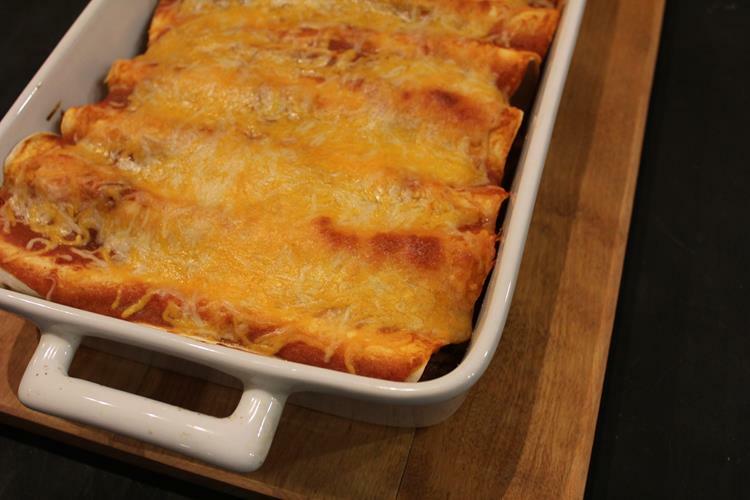 Ground beef enchiladas are a great quick and easy dinner that uses only four ingredients. It is a meal your family is sure to love! My week has not gone as planned. Not at all. It has turned into one of those weeks where quick and easy meals are a must. This ground beef enchilada recipe is not what I had planned to share this week, but as I said this week had not gone as planned. Instead of sharing what I planned, I decided to share reality. Reality right now is quickly putting together a dinner using what we have on hand. Sometimes I think that we get stuck on following exact recipes and having the exact ingredients. This is part of the problem with the social media driven world that we live in. We think we need to have it all together. We think we need to have perfect food, recipes, and pictures. Today’s recipe for ground beef enchiladas is far from perfect or exact. I am also pretty sure it is far from authentic. What it is though is a meal that uses less than five ingredients that I almost always have on hand. It is a meal that I can have on the table in about thirty minutes. 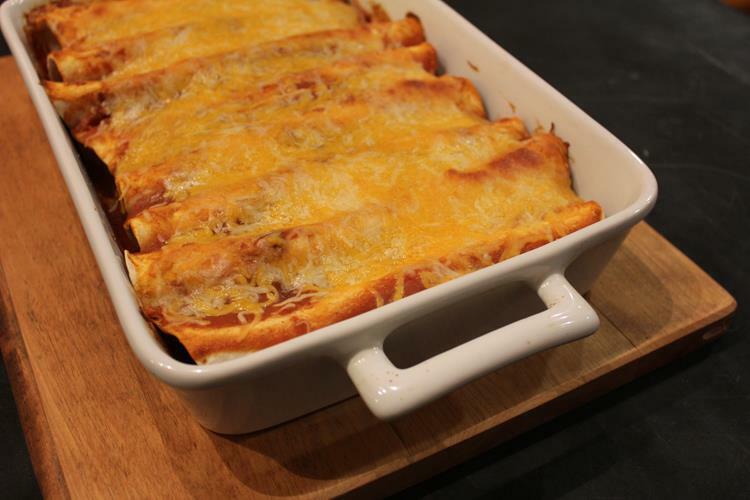 It might not be the exact way enchiladas are meant to be made, but it is a quick and easy meal that my family loves. Sometimes we have to throw our goals of perfection aside and just go with it. And that includes meals. There is nothing wrong with quick and simple recipes like this one today. If I am really in a hurry or if I am using gluten free tortillas I will often make these as fold over enchiladas instead of rolling them. It makes them even easier to make. 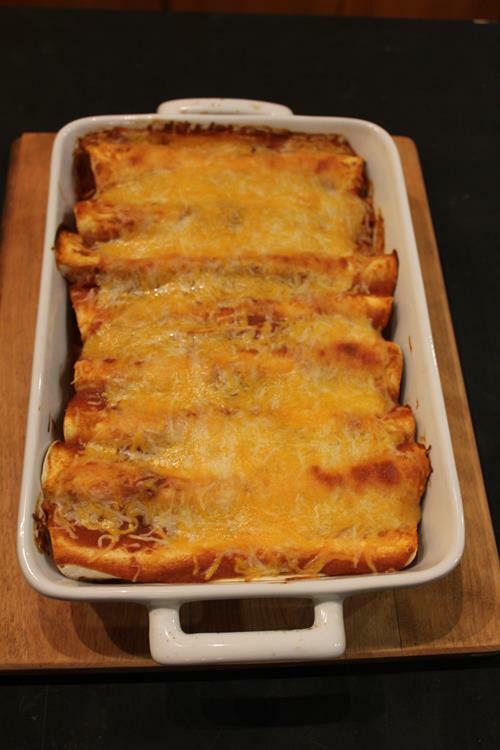 Easy ground beef enchiladas are an easy and delicious meal your family will love. In a skillet cook ground beef until browned and done. Drain off any fat. Add 1/2 cup enchilada sauce and 1 cup shredded cheese to the meat. Stir to combine. 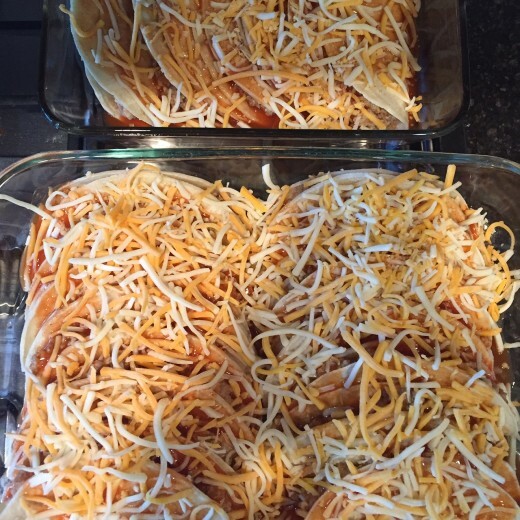 Spread 1/4 cup enchilada sauce into 9x13 pan or casserole dish. Spoon filling onto tortilla and roll tortilla. Place tortilla in pan and repeat until filling is gone. If I am using corn tortillas I use my fold over method for enchiladas. Pour remaining sauce over tortillas. Note: This recipe is not exact. You can vary the amount of tortillas and cheese that you use. This is more of a guide than an exact recipe to follow. I love enchiladas. I sometimes add a can of cream of mushroom soup to the sauce/meat/cheese mixture. Delicious! I love using cream of chicken instead. I also make my queso with cream of chicken….Lots of cilantro. I added a small can of mild green chilies and added green peppers to the ground beef while I browned it to add some veggies. Served it with diced fresh tomatoes and guacamole. Yum! I am so glad that you enjoyed it! I love the idea of adding peppers and chilies to this.